A SEAWALL HAS begun to collapse under a frequently-used railway line in Kent, England, with thousand of commuters set to be affected. Huge cracks in the seawall were discovered on Christmas Eve, which was severely damaged by high tides. “Teams of engineers are on site and we will do everything we can to reopen this stretch of railway as quickly as possible,” said a spokesperson. “We know how important the railway is for people in this area and our orange army is working round the clock to establish what action needs to be taken, though we know the damage to the sea wall supporting the railway is severe. Thousands of commuters are affected by the damage, and a replacement bus service has been put in place to try to deal with the issue. 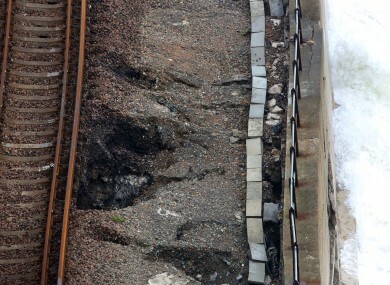 Email “Sinkholes appear beneath train track in England as seawall begins to collapse”. Feedback on “Sinkholes appear beneath train track in England as seawall begins to collapse”.